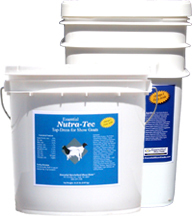 Essential Nutra-Tec is a pelleted top-dress product designed to increase the rack size and provide muscle definition and bloom to your show goat. For breeders, this product would be best utilized if fed 30 days prior to a sale to maximize your kids bloom. For exhibitors, this product should be fed 60 days prior to show to increase rack size, improve coat quality, and maximum bloom. Advanced Electrolyte System for increased muscle size. High milk content for increased bloom. Brewers yeast for enhanced digestion and a natural source of vitamins and minerals.